In the spring of 2016, Reshad, a 32-year-old Afghan, came to feel his life was on the line for "working with infidels" in his job as a civil engineer contracted to the U.S. military. "In a matter of seconds, I found myself being targeted, with four armed masked men pointing their automatic guns toward me," he recounted, the consequence of working alongside the U.S. Army during a drawn-out war, now in its 18th year. Reshad asked only to be identified by his first name, worried that the Taliban could target his family still in Afghanistan. For him and thousands more, it was neither easy nor quick to escape, but at least there was a way. For the past decade, Special Immigrant Visas (SIVs) have been granted to Iraqi and Afghan interpreters and professionals working for the U.S. government who face credible threats because of their employment. But this week, the U.S. moved closer to a peace agreement with Taliban officials, raising the possibility of American troop withdrawals, and beyond that, the huge demand for SIVs by interpreters and others who work with the U.S. military and face great danger when the troops leave. "Negotiations are [sic] proceeding well in Afghanistan after 18 years of fighting," President Donald Trump tweeted on Wednesday. "Fighting continues but the people of Afghanistan want peace in this never ending war." In December, Trump ordered the withdrawal of 7,000 U.S. troops in Afghanistan, cutting the remaining presence in half — a fraction of the 100,000 troops there in 2010. 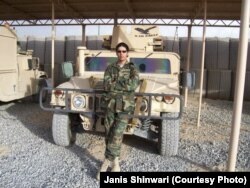 "If the U.S. troops leave Afghanistan, I'm 100 percent sure there won't be any peace in Afghanistan, and the first target will be all those interpreters," said Janis Shinwari, an Afghan SIV recipient and co-founder of No One Left Behind, a nonprofit dedicated to assisting Afghan and Iraqi nationals who served the U.S. government during wartime. 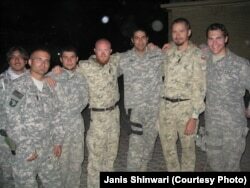 Janis Shinwari (third from right), an Afghan special immigrant visa recipient and co-founder of No One Left Behind, served as a translator for the U.S. military. Complicating matters is that no SIVs have been funded for 2019. The Trump administration requested an additional 4,000 Afghan SIVs be included in fiscal year 2019's National Defense Authorization Act, but that provision was ultimately omitted because of budgetary rules. Two senators have tried to attach funding for SIVs to the State Department budget. But State is one of the unfunded agencies caught in the recent government shutdown. Currently, 19,000 Afghans are in some stage of applying for SIVs, a Department of State, Bureau of Consular Affairs spokesperson told VOA. Shinwari says they are in danger. "There are a lot of people that lost their families, their siblings, in the U.S. airstrikes, and they can't come here (to the United States) to kill an American (in retaliation)," he said. "The easiest way they will kill somebody who supports the U.S. troops in Afghanistan (is through) interpreters and translators." Following his near-fatal encounter in Kabul, Reshad began the long application process for an SIV. He saw no other alternative to escape the Taliban. "They only think that these people are helping invaders, and they are invading our country, so they should be removed, they should be killed," he said. Since 2014, Congress has authorized 14,500 SIVs for Afghan principal applicants, including 3,500 in fiscal year 2018, according to the Department of State. While the SIV process took Reshad 18 months to complete, others have waited years. The long waiting times are the subject of a lawsuit. Iraqi and Afghan SIV applicants, who have been waiting as long as five years for a visa, claim the wait times are a violation of Congress' stated intent, which was that SIVs be granted within nine months of application. Wednesday, a federal court judge denied a U.S. government motion to dismiss the case and ruled it can go forward. The wait is one reason Reshad considers himself "the luckiest one among thousands." He is currently employed and in pursuit of a U.S. engineering license, and has helped fellow Afghan immigrants settle in the area where he and his family live. Many are less fortunate. Once relieved of duty, eligible SIV recipients who wait too long often incur psychological damage, if not death, according to Shinwari. Those from remote villages are more susceptible to threats from the Taliban and therefore go into hiding, he explained, to protect themselves and their families. "They don't have jobs, they don't have money. Most of them are doing labor jobs in Kabul City, and most of them turn to drugs because of the tension," he said. Former U.S. Army interpreter Qismat Amin, left, is greeted by supporters after arriving from Afghanistan at San Francisco International Airport, Feb. 8, 2017, in San Francisco. Amin waited nearly four years for his special immigrant visa. Other families, once approved and issued SIVs, have faced difficulties en route to the United States since the Trump administration has increased scrutiny of visa holders. Earlier this month, an Afghan translator for the U.S. military and his family were temporarily detained upon arrival at George Bush Intercontinental Airport, the Houston Chronicle reported. Another interpreter was detained in 2017. Unless and until there is lasting peace vacant of threats, Reshad worries about his family and others in Kabul. "We pray (to) God every day when they go outside for their normal workday," he said. "Who knows who is coming back alive at the end of the day?" Shinwari vows to push until the end. "We will fight until we get everybody here, because they did their part," he said.